Combined with a proper diet, physical rehabilitation can help your overweight dog lose weight and/or help your dog maintain an appropriate weight. We offer a canine weight management program with low impact physical exercises and strengthening exercises. An overweight dog has greater stress on painful and weak joints, higher risk for diabetes, and certain breeds have a much greater risk of herniating a disc in their back because of obesity. A dog that is in good physical condition is less likely to suffer musculoskeletal injuries. 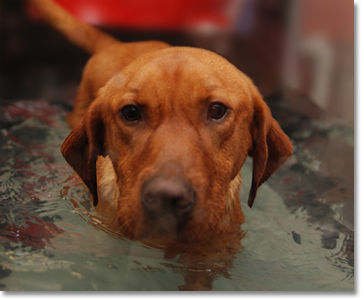 The underwater treadmill provides a safe, low-impact way to exercise your dog and can ultimately help him/her lose weight. It is very low impact so injuries can be avoided, while working all of the major muscle groups of the legs and moving the joints through a full range-of-motion. This is an excellent way for dogs to stay in shape, safely and effectively in a controlled environment.